Villa World is close to a sellout at two projects in Thornlands on Brisbane’s bayside, driven by local buyers who are keen to downsize to a high quality new estate. The two developments, Affinity and Waterline, are among five projects undertaken by Villa World in the area and they have received a high level of interest since their launch to the market in 2015. Sales have been buoyed by sought-after views of the Moreton foreshore. There are only 11 lots remaining at Waterline which will be home to about 230 families when completely sold out, which Villa World is expecting by late March or early April. Villa World development manager Peter Johnson said there has been a greater sense of urgency among buyers as the sellout nears. 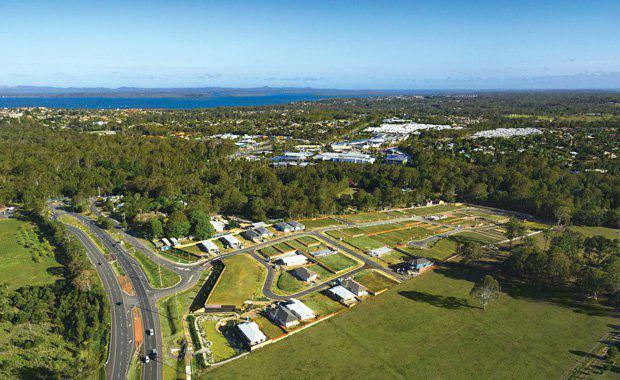 “We are selling on average eight properties per month, with the Waterline demographic largely comprising Redland Bay locals who are looking to downsize to an area close to shops and transport,” said Mr Johnson. Waterline is now fully registered, with only Stage 5 and 6 lots still available. The residential community offers house and land packages as well as land-only options. Metricon sales display at WaterlineAffinity comprises 118 lots and, with only 20 remaining, Villa World is expecting a sellout in coming months. Affinity development manager Andrew Ashwood said Affinity offered elevated lots in a natural bushland setting. “We are into the final stage of this development which is in a highly sought-after location with limited availability,” Mr Ashwood said. The general buyer demographic at Affinity has been young families who are local to the area. The lots range in size from more than 300sqm up to 697sqm, with a starting price of $299,000. Affinity also offers house and land packages for buyers. Villa World’s latest project in the Bayside region is Seascape at Redland Bay, where townhomes just 650 metres from the water’s edge, are now selling from $445,000.